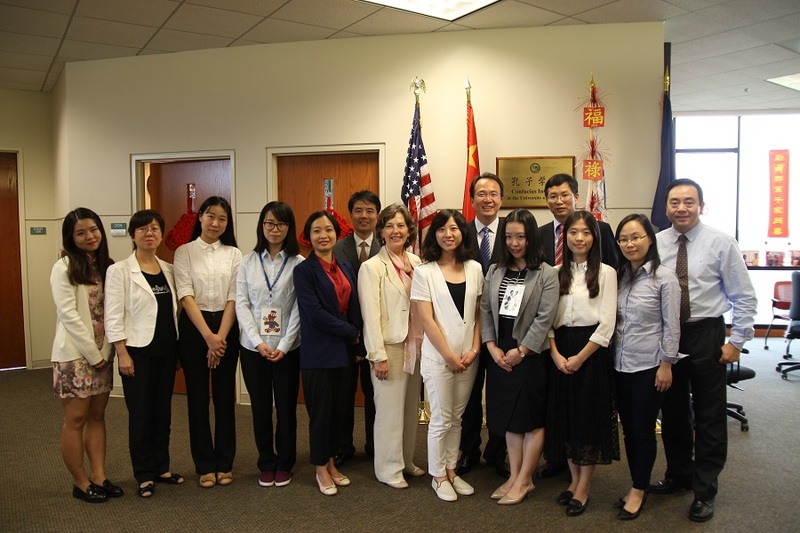 On August 23, 2016, Consul General Hong Lei paid a visit to Confucius Institute of the University of Kansas. The Institute was decorated with warm Chinese red, exquisite Chinese paintings and made Consul General Hong Lei immersed in an environment of intense Chinese culture characteristics. Ms. Sheree Willis, Executive Director, and Jiangang Wu, Associate Director, briefed Consul General Hong on the development of the Institute as well as its distance learning program and overall education plan, expressing that the Institute will devote constantly to the promotion of Chinese language education, and the people-to-people exchanges between China and the State of Kansas. CG Hong Lei congratulated on the progress made by the Institute, and spoke highly of its contributions to the Chinese language education and promotion of Chinese culture. He said that, as the largest developing country and the largest developed country, China and the United States are building a new model of major-country relations, and language is an important media in terms of culture and communication. CG Hong wished that the Confucius Institute do a better job in playing a bridging role in cultural and educational exchanges between China and Kansas. The Chinese Consulate General in Chicago will continue to support the Institute. Deputy Consul General Yu Peng was present during the visit.